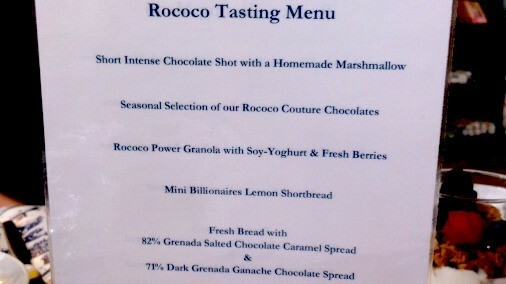 If you needed any further reason to make Rococo your home from home, their new tasting menu is it! 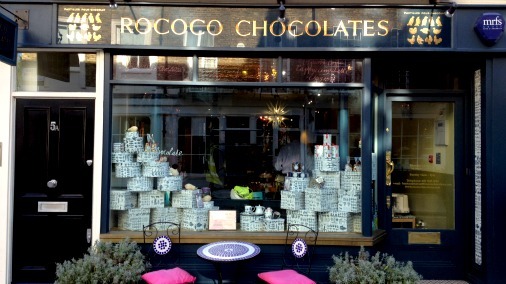 At the back of that chocolate lovers paradise, Rococo Chocolates boutique on Motcomb street, is a small but perfectly formed café. It is the ideal excuse to stay longer, to contemplate your potential purchases, to breathe in the oh-so-tempting air. 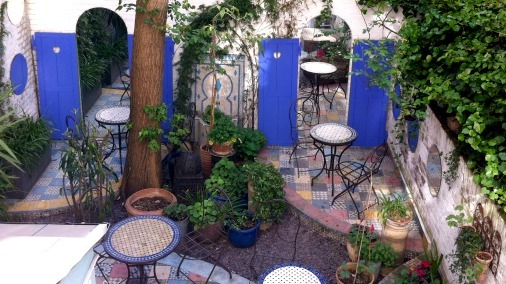 It is a lovely spot, if the weather is fine enough you can bask in the quirky beauty of the MaRococo secret garden, if not you can still enjoy the view of it from the windows of the café. If you are already familiar with this small corner of happiness then you will know just what I mean, if you don’t, then you are in for a treat. Either way, familiar or not, Chantal Coady and her Master Baker Louisa have given us a wondrous extra reason to visit. They have launched a tasting menu, available to order, which I was lucky enough to be invited to try. The intention of the menu is to allow a fuller experience, with more treats to savour than the current offering. It could serve as a breakfast, instead of lunch, or for afternoon tea. And the menu now launched will likely develop to include some savoury dishes, which will allow Louisa to recreate more of the recipes from Chantal’s superb books. On arrival I was given a cup containing a hot chocolate shot. It was barely sweet, dark, delicious, and complemented by a cubed cloud of vanilla marshmallow for dipping. A wonderful touch, the sweet airiness of the one the perfect vehicle for the deep intensity of the other. It was a great start to a fine and full flavoured repast. Without fuss, with generosity, all the treats we were offered were straightforwardly delicious and impossible to refuse. Forgive me for the lack of photos, of the divine hot chocolate in particular, the food was distractingly good! 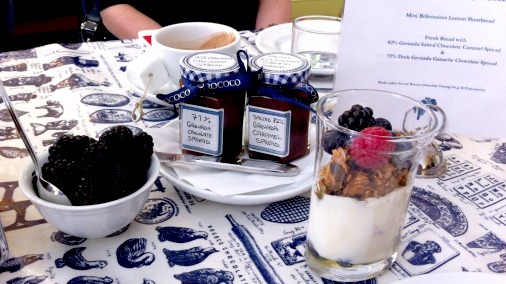 The exceptional Granola, and those spreads…..! 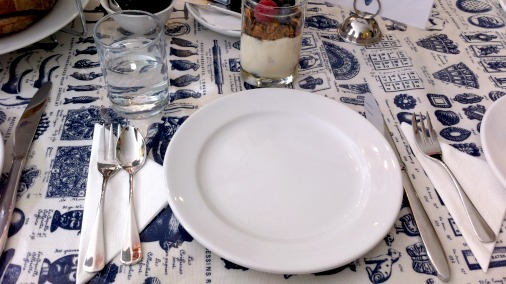 We turned to the cocoa nib granola next, served with fresh berries, a spot of honey, and coconut vegan yoghurt. I was intrigued by the use of this yoghurt, but needn’t have worried, because the emphasis throughout is on flavour. Although I have never tasted vegan yoghurt before, I was delighted by the creaminess, tang and subtle nuttiness of this. The granola itself could not have been bettered. The recipe is from Chantal’s ‘Mastering the Art of Chocolate’. I will have to have a go myself. Bread and spread. Both perfect. The sourdough on offer was from Ottolenghi across the road. 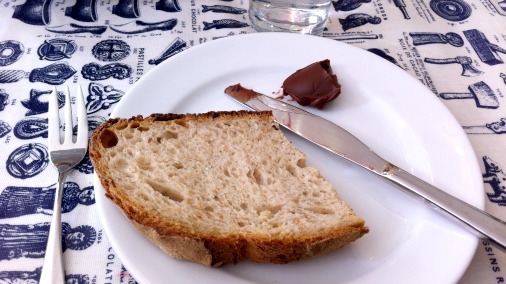 Its chewy crumb and slight sourness was the correct foil for the richness of two glorious spreads. A 71% Grenadan was a dark, fruity and well judged ganache. The 82% Grenadan Salted Caramel Spread was a fine deep caramel, lifted with salt. I have tasted a lot of spreads, these were as good as they could have been. I strongly recommend Rococo to sell them by the jar. If they don’t they will get tired of the requests to do so! 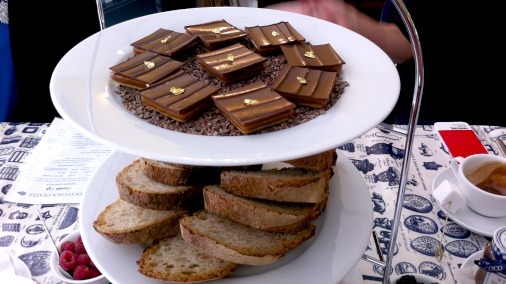 Another of Chantal’s recipes, the millionaire’s shortbread, is delicate, indulgent, and enhanced with the addition of lemon. The lemon does something very clever to this classic rich recipe, brightens it just enough to make it very easy to eat more of! Last but not least, chocolates, of course. To finish, chocolates. We are in a chocolate shop after all. And what chocolates! On this occasion we were given the Kalamansi Lime and Mandarin & Tonka caramels. 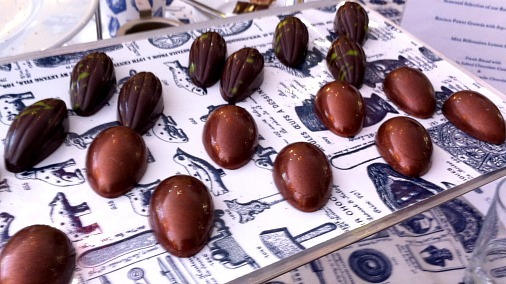 Both are multi-award winning, the Mandarin & Tonka garnering gold at the recent The Academy of Chocolate Awards. I found the whole a glorious and indulgent interlude. And at £18.75 per person it is fine value too. I can already think of certain people I know would love this and will be making my booking imminently.